As a Howard County elementary school, we follow Archdiocese of Baltimore Curriculum Standards which are aligned with national standards. Kindergarten emphasizes teaching children a love of learning through developmentally appropriate hands-on activities for growing socially, academically, spiritually and physically. The language arts program is phonics-based with a strong emphasis on literature. Manipulatives and cooperative learning groups are used daily in math, social studies, science, and art classes. Religion lessons are integrated daily as we stress sharing and kindness to one another in all that we do. 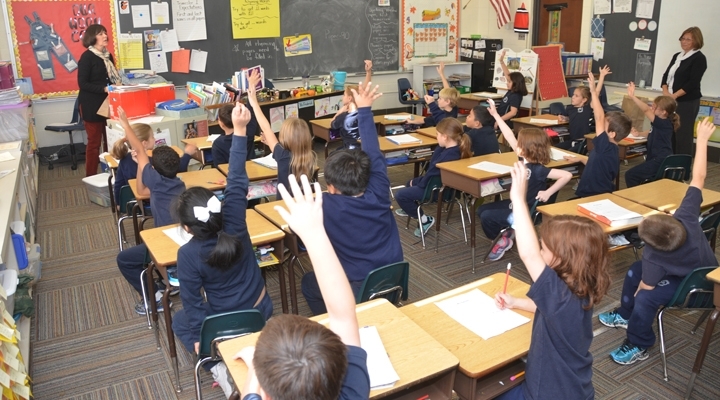 Grades one and two are self-contained classrooms with one teacher and a shared teaching assistant per class. Resource classes are available for reading. The reading curriculum utilizes the McGraw-Hill Treasures series with emphasis on phonics and comprehension. Writing is an important part of the program. The math curriculum emphasizes an understanding of concepts, computation and problem solving. Math manipulative materials are used to enhance skills. Social studies and science are taught as an awareness of the world. Periodicals, manipulative materials and experimentation are used to enrich these subject areas. Spanish is taught twice each week. Library, art, music, physical education, and technology classes are held weekly. Religion is taught and modeled daily. Prayer is an integral part of the day. The primary grades participate in Liturgical celebrations as planners and participants.